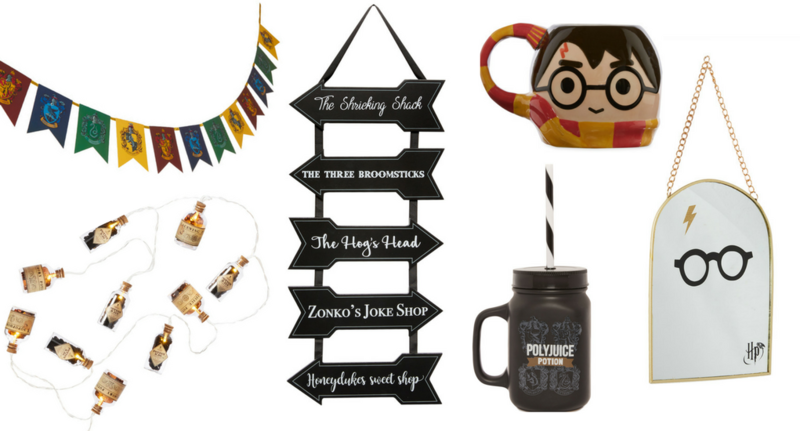 After the success of some Hogwarts-inspired pieces previously, Penneys has launched a new Harry Potter range – and we love it! As always, Penneys (or Primark if you’re in the UK) has absolutely come up trumps. 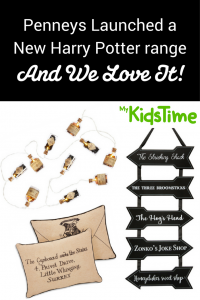 With everything from cushions and bed linen to Christmas decorations and clothes, you (and the kids) can get set for some serious Hogwarts style. Many of the items in the new Harry Potter range hit stores this month, with more coming in September and October. Start checking your local store now, as these won’t last long (remember the drama with the Beauty & the Beast Chip purse…?). What house would the Sorting Hat have put you in? 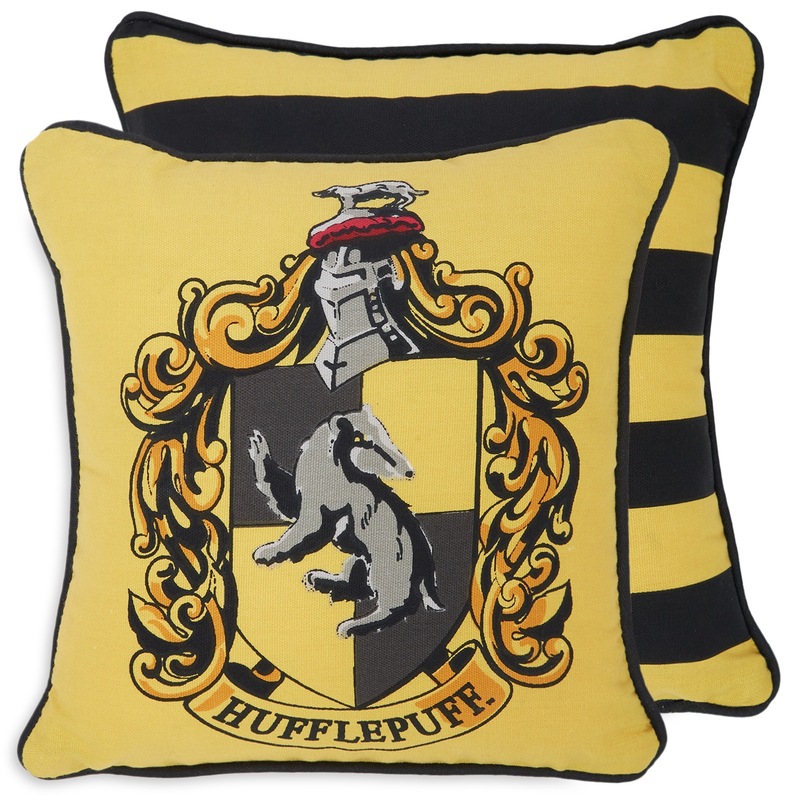 Are you a Hufflepuff, Ravenclaw, Slytherin or Gryffindor at heart? 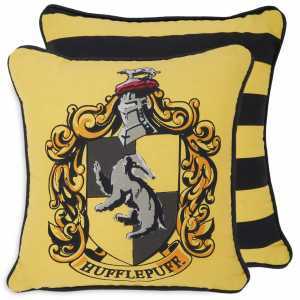 Pick your favourite Hogwarts house and decorate accordingly with these house-inspired cushions (€5/£4 each) and co-ordinating throw blankets (€8/£6 each). There’s also a white Hedgwig-shaped cushion (€8/£6) to cuddle up with. These would be perfect for kids’ rooms, and are a really quick and easy way to theme the bedroom decor. Deck yourself out from head to toe! 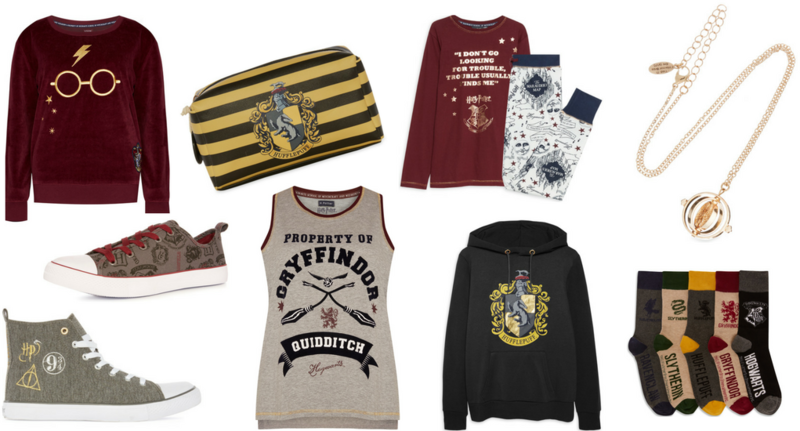 There are loads of fun bits in the Harry Potter range to choose from, including hoodies and sweatshirts, t-shirts, pyjamas, onesies and dressing gowns designed to look like Hogwarts robes or printed with the Marauder’s Map. If kitting yourself out for bed isn’t enough, you can also get themed bed linen! Don’t forget to accessorise – take your pick from a Hermione’s fantastic time turner necklace, pendant chokers, earrings, pin badges, slippers, socks, trainers and lots more. Clockwise from top left: burgundy velour glasses sweatshirt (€12/£10), Hufflepuff makeup bag, available in each house colour (€5/£4), kids pyjamas (€11/£8), time turner pendant necklace (€4/£3), pack of 5 Harry Potter socks (€8/£6), Hufflepuff hoodie, available in each house colour (€14/£12); quidditch pyjama vest top (€6/£4.50); boot trainer (€14/£12); lace up pumps (€11/£8). Your morning coffee has never looked so good! We are completely besotted with the range of mugs coming into stores, particularly these Keeper and Catch mugs (€8/£6) for quidditch fans, as well as a black cauldron-shaped mug (€7/£6) for a really magical cuppa. 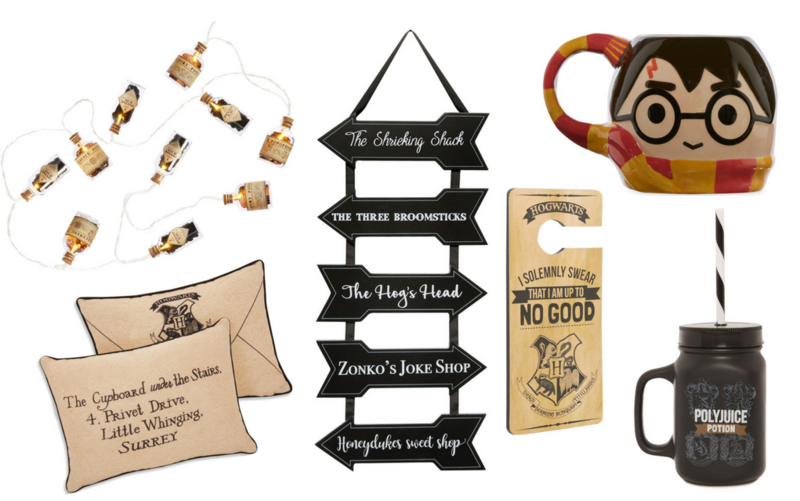 Complete the look in the kitchen with hanging message chalkboards (€5/£4 each), a Hogwarts-design pin board (€10/£8), and a set of four drinks coasters representing each of the Hogwarts houses (€5/£4). If quirky is your style, then these are for you. 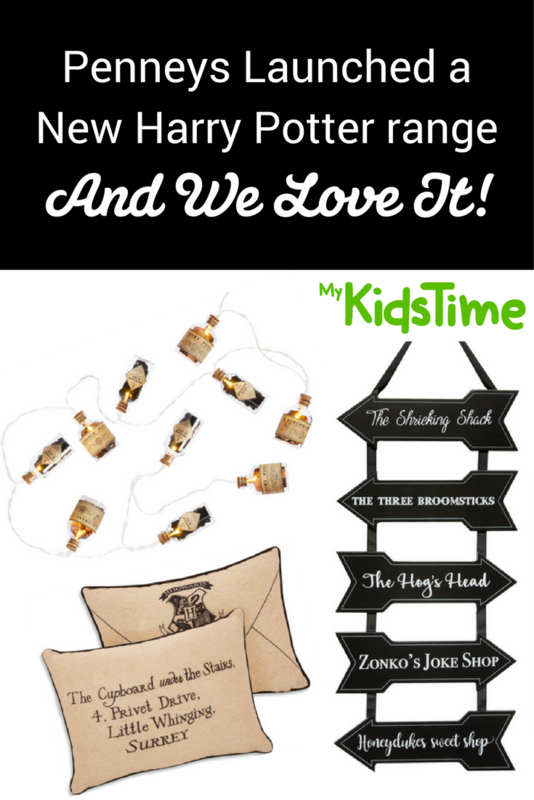 These would also make a great way to set the scene for a Harry Potter-themed birthday or party. Clockwise from top left: Hogwarts bunting (€4.50/£3); hanging arrows sign (€8/£6); Harry Potter face mug (€7/£5); Harry Potter mirror (€6/£5); Polyjuice potion mug with straw (€5/£4); potion bottle lights (€10/£8). True fans will love the Christmas baubles that are due in stores from the end of September. 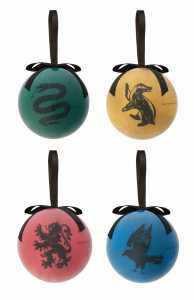 Choose from a single Hogwarts crest decoration (€6/£5), a set of four different coloured house baubles (€5/£4), or a festive gold bauble decoration (€6/£5). Can your Christmas tree compete with the grandeur and wonders of Hogwarts? 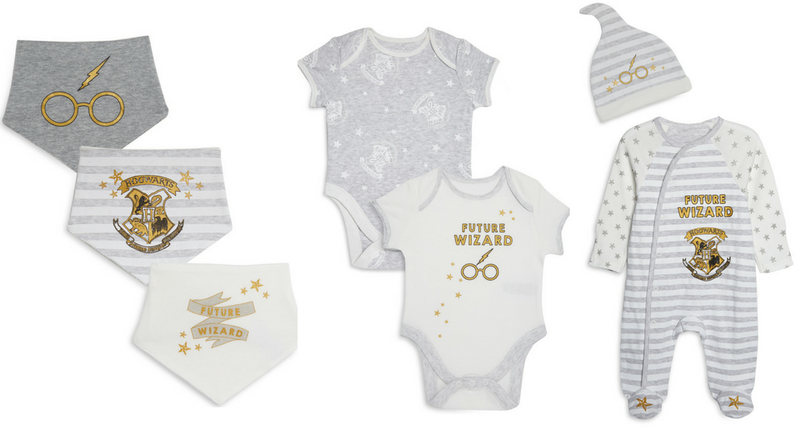 Even the littlest family member can get in on the action with baby items from the new Harry Potter range. We love this three-pack of bandana-style bibs (€4/£3) in neutral colours, while the matching baby vests (€7/£5) and Future Wizard babygrow and hat set (€8/£6.50) would make great gifts for a new bundle. 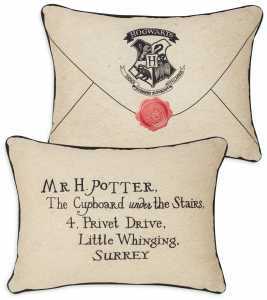 This Hogwarts letter cushion (€8/£6) is it. It is perfect, and unusual enough to add some style to any room in the house. 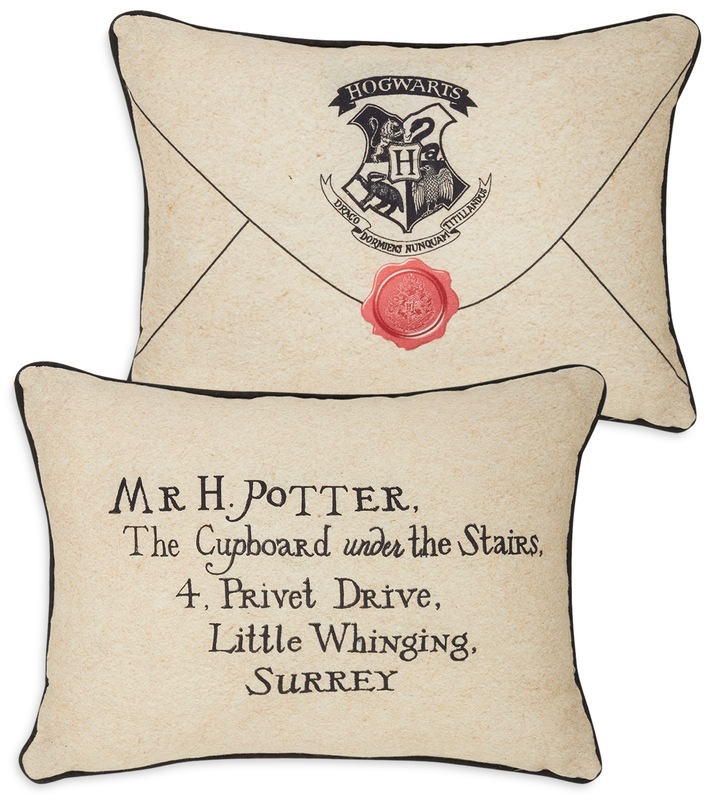 I don’t know about you, but I read the Harry Potter series and hoped (in vain, clearly) that a magical Hogwarts letter might appear. My daughter, now reading the books for the first time, is equally besotted and listed ‘Hogwarts professor’ as her dream occupation at school recently. I think I may need to get her one of these cushions too! 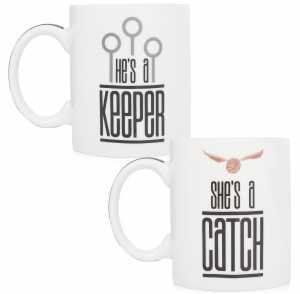 What’s your favourite piece from the Harry Potter range at Penneys? Leave a comment below and let us know – we’d love to hear from you!